Email verification and hygiene is an important part of making sure that the records you’re getting and the records you’re sending are valid emails that inbox. 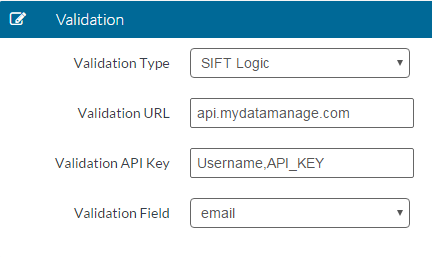 Fortunately, we’ve take the liberty to connect with companies such as Sift Logic and Impressionwise to help automate the verification process and make sure your records are getting cleaned and delivered in real time. How does this work? The records first come in from your publishers or web forms, then pass over to the verification platforms which append a value that indicates if the record is cleaned or unclean, after verification the record is inserted into your Waypoint Software instance, filtered at a campaign level, and finally delivered to your clients or ESP’s. 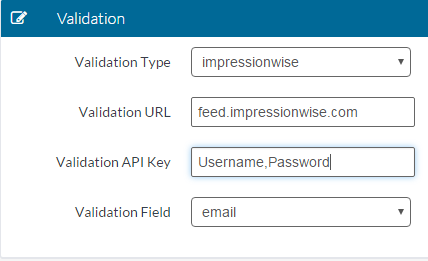 To begin automating this process inside your instance, you must first create an account with the verification platform of your choice and acquire the API and FTP credentials for that account. Once you have these credentials you’ll want to navigate to the source inside your instance that you want to add the verification to. Edit the source and scroll to the bottom where it says, Validation. Finally, select the validation type as email and save the changes to the source. Your setup should look similar to the images below. You’re now verifying records in real time and filtering out the invalid responses through your campaigns. Waypoint Software Team: The Waypoint Software development team seeks to provide insight about their lead management platform as well as other aspects in the big data field.